a bomb in Oslo as a distraction, killing eight in the countries capital. Breivik then dove 25 miles, disguised himself as an officer and carried out a shooting, killing 69 children at the Labour parties political summer camp on the island of Utøya. Netflix released a film inspired by the events on Oct. 10, providing backstory, heartache and the trial of the shooter. The show is based on “One of Us: The Story of a Massacre in Norway — and Its Aftermath,” by Åsne Seiersta, a Norwegian freelance journalist known for documenting everyday life in war zones. Director Paul Greengrass, known for creating movies covering sensitive topics, goes about this event with empathy without masking the brutality. With only the first 30 minutes covering the terror, the remainder of the film sees the aftermath the survivors, their families and the countries faced. The movie opens with the events that preceded the terror attack. Anders Behring Breivik, played by Anders Danielsen Lie, is seen concocting his plan, preparing his weapons to the bewilderment of his mother. In contrast, the kids are seen arriving at the camp full of joy and excitement. Filmed with a Norwegian cast speaking in English with thick Norwegian accents, the authenticity of scenes could not be more real. Using the words believed to be screamed by the shooter himself, Greengrass carefully depicts the changing political climate of Norway, and the growing far-right, Neo nazi party across the whole of Europe. The nature of the film does make it hard to watch, but the issue at hand is so important. Attacks of this nature in 2011 were rare to European nations, and Greengrass’ translation of these events stands as a teaching point. Sadly, following the events portrayed in the movie, including Breivik’s trial, proves that he is not alone with his political motivation behind the attack. The film closely follows real life survivor, Viljar Hanssen (portrayed by Jonas Strand Gavli), who sustained four bullet wounds: one to each arm, his right leg and just above his right eye, which left bullet shards fractionally close to his brain stem. Viljar struggles with post traumatic stress, seeing his attacker’s trial on television and living with the possibility that he could drop dead at any point as a result of his injuries. Senior international business major and Swedish native, Tove Sparrman spoke of the importance of the film. “It’s really important for people to actually realize that terrorism doesn’t have to be based on race or religion,” Sparrman said. Elin Kvarnemar, (‘18) alumna and Scandinavian native, highlights why American students should watch this documentary, in order to get a broader picture of the world and struggles outside of this continent. “Sometimes they (Americans) forget that the world is bigger than just the United States, and because Norway is one of the countries you would least expect something like this to happen in,” Kvarnemar said. 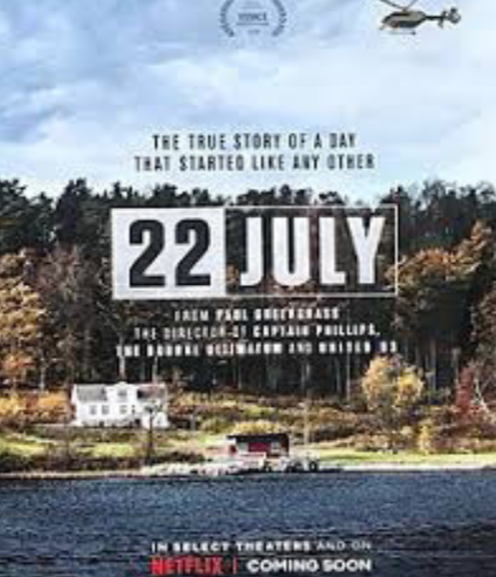 Greengrass’ movie shows that the people of Norway will continue to honor those who lost their lives in this event. In doing so, he also shows the importance of tragedies like this brining a country together; the people of Norway will continue their lives, like Hanssen, but not forget such cruelty exists in the world.